Tandem skydiving prices and discounts at Skydive Cross Keys, a world class skydiving center in Williamstown NJ near Philadelphia. Get your skydive recorded on video and photo by one of our professional freefall videographers! You will get 50-100 photos and a professionally edited video delivered to you by email after you land. Group discount: 5+ people get $5 off each, 10+ people get $10 off each! Group rates don't apply on Tuesdays or when using a Military or Student rate. Military Discount: $189 online only. Military ID required at check in. Group discounts don't apply when using military rate. Advance booking and prepayment required to get the discount. Student Discount: $189 online only any weekday May 1 - Oct 31. Student ID required at check in. Group discounts don’t apply when using Student rate. Advance booking and prepayment required to get the discount. Tandem Tuesdays: all tandem jumps $189 online only, any Tuesday May 1 - Oct 31. Group discounts don’t apply. Advance booking and prepayment required to get the discount. 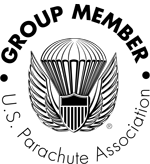 Early Bird Weekends: $10 off online only for 7 AM tandem jumps every Saturday & Sunday July 1 - August 31. Advance booking and prepayment required to get the discount. Observation deck, food trucks, free wi-fi, plenty of photo ops - your spectator friends will have a great time too! We don't offer handycam videos from your instructor's wrist, because your instructor's only focus will be on the safety of your jump. Our top quality photo and video packages are offered by professional videographers who will jump along with you!